Just yesterday, we told you the news about the probable release date of the next part in the Dark Knight’s adventures series, and today we’d like to share some more fresh information about this project. This time it involves the exclusive Batman: Arkham Knight DLC for PS4. At the official PlayStation site, the details about the first game’s add-on - Scarecrow Nightmare Pack - have appeared. Sony company has mentioned it during the press-conference at E3 event, but then neither the title, nor the content of the upcoming DLC has been known. But according to the rumours, this add-on would have brought to the action-adventure only the new Batman suit. Fortunately, Sony has denied such information. 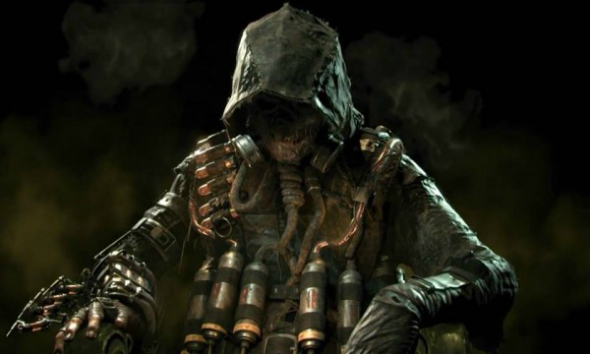 So, the first Batman: Arkham Knight DLC for PS4 will include an exclusive mission, related to the one of the game’s antagonists - Scarecrow. According to the official description, Gotham is poisoned with the fear toxin, which turns the city into the real chaos and “hellish nightmare”. The players will have to fight against the invincible Scarecrow’s army, which consists of zombies. They fill the Gotham’s streets with panic. It’s sure enough that this mission will not dispense without the main gameplay element - the Batmobile. In the exclusive Batman: Arkham Knight DLC for PS4, we’ll see the upgraded Dark Knight’s vehicle. Do you have a PS4? Would you like to try your hand at vanishing the Scarecrow’s army?